Canadians have always had natural great style. A modern Canadian aesthetic is happening in design and “Cottage style” has grown up, no longer just a place to relegate old furnishings. The cottage is a place to kick up your feet and chill without comprising design and style. Make it a retreat, letting nature be the starting point and everything else a way to further enhance the enjoyment of it. 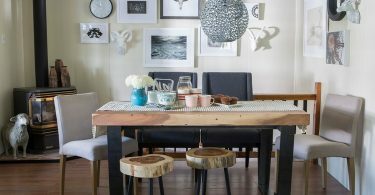 Canadiana inspired decor and style has never been more au courant, and has gone from country to rustic to now an interesting merge of contemporary and modern with mid-century having a huge comeback and impact. 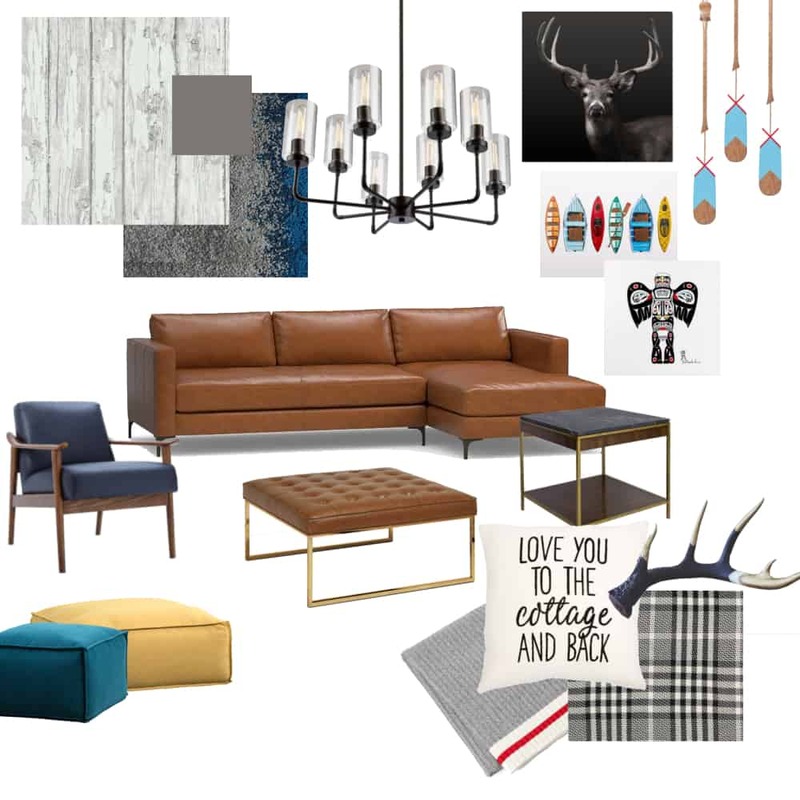 My cottage chic is a merge of mid-century style with modern interpretations of nature and Canadiana elements. Depending on your style, the cottage can be a great place to play with modern – especially when it comes to light fixtures. Black and dark hued metals look industrial but can take on a more elegant light when combined with gold or bronze finishes or accents. Wallpaper at the cottage? Why not! Especially since it can be an easy way to get that reclaimed wood look without any fuss. Spruce up a hallway or create a stunning feature wall. I like the white faux wood paper – it is very fresh! I love to incorporate greys at the cottage as the perfect transitional hue that brings a bit of a city vibe to the cottage. Almost every color looks sophisticated with neutral grey and it pairs well with watery blues, whites or deep rustic leather tans and browns. I love the easy care and flexibility of carpet tile at the cottage. The new nature line in deep cobalt blue is modern, echoing images of “water to the shore” and is an easy way to provide softness underfoot just about anywhere. Jake Sectional from Pottery Barn. Leather is a luxurious no-brainer at the cottage but leave the jet black to the city. Instead, opt for rich earthy hues in tan, brown or caramel. Classic Mid century modern lines and sophisticated navy aegean blue leather look straight out of 1950s New York, but laid back and comfortably suited to cottage lounging. Functional and Canadian made, these contemporary upholstered ottomans are extra seating that doesn’t compromise style or quality. 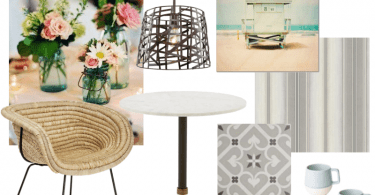 End tables are and extension and the jewellery of your sofa – even at the cottage. These beautiful mid-century marble and walnut side tables are timeless. Practicality need not be boring. 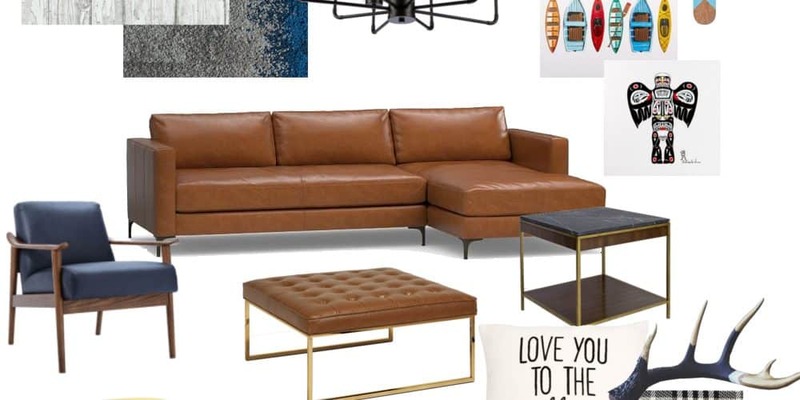 This on point gold and leather ottoman is the optimum of chic cottage style. A cottage without a paddle? No Canuck should go without one of these authentic posh paddles. 2 paddles are better than one, but when decorating, three is always best. Make a statement by hanging them above a fireplace, or horizontally above a sofa. You don’t have to spend a lot for art at the cottage, but a buck or two (pun intended) well spent can get you impactful art. Nothing draws you in and creates a focus like black and white photograph. Arts and crafts projects are especially welcomed at the cottage. Gallery walls tell a story and is a perfect way to add pop to awkward or boring bare walls. 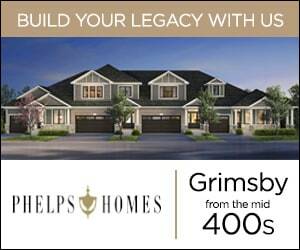 Frame cool prints, post cards and iconic landscapes to add a little or a lot of Canadiana to the cottage. Expressions “Cottage and Back” Throw Pillow from Indigo.